Dermapen® is safer and more effective in piercing the skin than traditional skin micro-needling rollers due to its unique vertical micro-needling technology. Dermapen’s multi-speed and adjustable needle depths allow the needles to pierce the skin’s layers at 90 degrees and increases the effectiveness of needling by generating a precise, comfortable and relatively short needling session, while providing less pain and downtime for the client. Dermapen can effectively maneuver in hard-to-reach places (e.g. around the eyes, nose, and lips). Because of the vertical delivery, the needles can easily penetrate scar tissue and promotes scar-less healing similar to fractional laser treatments, IPL, laser resurfacing, and chemical peels, without the side effects and downtime. The mechanism of injury is a natural process, which makes Dermapen a holistic approach to skin therapy. Four major phases of physiological wound response help in stimulating new healthy tissue growth. First, an inflammatory response (1-3 days), to the initial injury promotes the chemotaxis response and proliferation of fibroblasts. The body’s platelets also respond to initiate a wound matrix. This response is the early phase of cell migration to remove debris and bacteria and stimulate the next proliferative phase. During the second phase (3-5 days), the new fibroblasts, monocytes, keratinocytes of the first phase continue to proliferate and multiply. New collagen will be laid down and deposited with new tissue formation. Next a fibrotic response (5-20 days), of growth factors are released and fibroblasts release collagen. 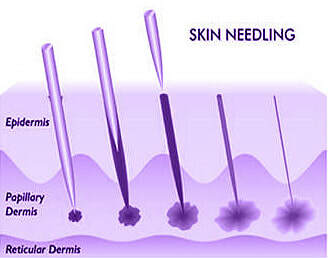 Finally, the maturation stage of new healthy skin takes place from day 28 to two years after needling. Collagens mature and stiffen and the matrix of new tissue shows 80% to full tensile strength.. The application of vitamin A and C creams may be recommended for up to 4 weeks prior to the commencement of the procedure. Sessions with Dermapen take between 10 minutes and an hour depending on the size of the area being treated. Pain should be minimal due to the application of the topical anaesthetic; however you may still feel some discomfort. The skin will be pink or red in appearance following treatment, with some minor bleeding and bruising possible, depending on the aggressiveness of the procedure, i.e. the length of needle used for the particular indication being treated and the number of times it is used across the treatment area. The recovery may therefore take 24 hours or up to a few days; most people should however be able to return to work the following day. Potential complications include minor flaking or dryness of the skin, with scab formation in rare cases. Hyperpigmentation can occur very rarely and usually resolves after a month. If you have a history of cold sores, this could possibly flare up after treatment. (We recommend you seek a prescription for your usual cold sore treatment from your physician before treatment). It can take between 4–6 weeks before visible signs of skin regeneration are seen and the process will continue over the following months, providing a gradual enhancement. A single treatment can produce noticeable results, however a program of 2–5 treatments spaced 4-6 weeks apart is often recommended to achieve optimum results, in conjunction with the at-home regime. The specific number of sessions required will depend on the area being treated and the severity of the indication, as well as the level of natural response from the individual’s body.